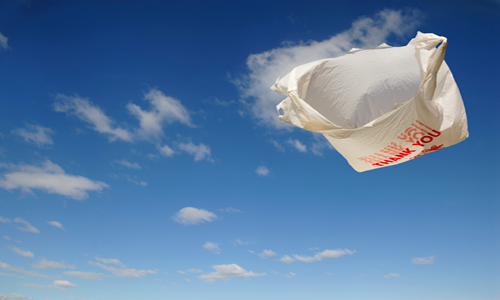 The Government is right to grant an exemption for biodegradable bags from the 5p carrier-bag charge due to take effect in England on 5th qualify for the exemption. The BPF and the Recyclers know or ought to know that the characteristics of the different types of biodegradable plastic are not the same. Some are compatible with recycling and some are not. There is no doubt that bio-based plastics marketed as “compostable” are not compatible with recycling, and should not therefore qualify for the exemption. Moreover, the purpose of the legislation is to address the problem of plastic litter in the environment but these plastics are tested to biodegrade in the special conditions found in an industrial composting or biogas facility – not in the open environment. Worse still, they are far too expensive for everyday use and if they get into a landfill they will generate methane, which is a more powerful greenhouse gas than CO2. These plastics are not in fact compostable because they convert rapidly into CO2 gas, not into compost. Recent studies have shown that some of these “compostable” plastics create residues which kill earthworms and inhibit the germination of plants. There is another type of plastic, manufactured in Brazil from sugarcane, which is compatible with recycling, but it is not biodegradable, so it too fails to qualify for the exemption. The only type of plastic carrier bag which will biodegrade in the open environment if littered, but can also be recycled into new carrier bags, garbage sacks etc. – and can therefore qualify for the exemption – is known as “oxo-biodegradable.” This is a normal polymer to which salts have been added and which converts automatically at the end of its useful life by an abiotic process of oxidation into biodegradable materials. These materials then biodegrade by a biotic process in the same way as a leaf. There is little or no extra cost for oxo-biodegradable plastic. Scientific evidence has been produced to DEFRA that oxo-biodegradable plastic can be recycled without the need for segregation, but the recyclers have produced only scare stories with no scientific basis. DEFRA accepts that oxo-biodegradable plastic does degrade and biodegrade, but is unsure of the time that the second (biotic) phase will take. This may be relevant for special applications like mulch-film, but not for carrier bags. If oxo-biodegradable plastic merely fragmented without biodegrading, CEN would not have defined oxo-biodegradability, and the American and British and French Standards authorities would not have included tests for biodegradability in ASTM D6954, BS8472 and AC T51-808. An LCA on shopping bags was written by Intertek in 2012 which included the litter metric, and they put the environmental credentials of oxo-biodegradable plastic ahead of bio-based and conventional plastics and paper. DEFRA have found no evidence that biodegradability encourages littering. The fact is that there will always be people who dispose irresponsibly of their waste, and that type of person does not care whether it is biodegradable or not. The government has recognised that for the foreseeable future it is impossible to collect all the plastic waste and that some of it will get into the open environment. It is for that reason that they wish to encourage the right type of biodegradable plastic by granting an exemption from the 5p charge.